This is a copy of the original A4 sized Pen and Ink illustration of St Peters Church, which I Hand-Coloured with Crayon Pencil. It is Part Two of a Project for the Barry Joel Gallery in South Croydon that I devised, comprising a series of three Pen and Ink drawings that were made into Cards and Prints. There is also an Original Print version of this one in Black and White and a Card Version, red on a pale straw parchment background. Having previously bought the original pen and ink illustration of the Water Tower on Reservoir Hill at the Coombe Cliff Gardens, Barry Joel asked me to do two others: St Peter’s church and Sanderstead church, which I did. 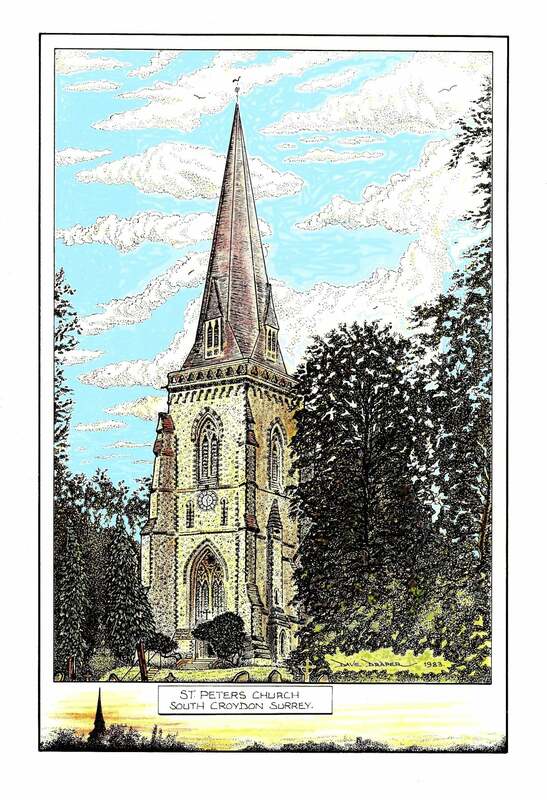 I sold all three to Barry at his Art shop in Croham Road, and he made the drawings into a series of cards and A4 prints. These were sold in various shops in and around Croydon.